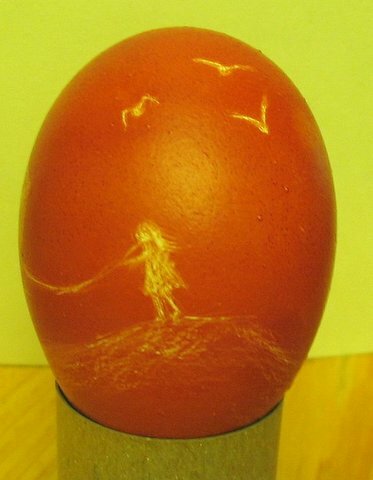 This is an Easter egg I decorated a few years ago for a friend’s daughter. I scratched the design into the surface of the egg using an Exacto knife. My favorite method of colouring the eggs is to get brown or red onion skins from the grocery store. They are all too willing to get rid of them but they tend to treat you like you have just escaped from somewhere when they find you rooting through the boxes of oinion and stuffing bags full of the loose skins. These days they remove them from the boxes every day, so invariably I have to ask them if they have any. They may produce three skins and I have to explain… “No! I need as many as I can get…. All you have of them!” (“Surrrre, Lady! You colour your eggs with them….”). I take the skins and wrap them around the eggs (You can soak the skins in water to soften them before you do this step). In the days before pantihose, we used thread to wrap around them to hold the skins on. Now, I wrap them in the skins and drop them into a length of pantihose, making a knot in between each egg, or place them in one of those net bags that come with the oinions. Using thread as well as placing them in the pantihose usually makes interesting lines on them. For brown and yellow eggs, use brown onion skins, for red use …errr… Red onions. You can combine the two but I would boil them in a separate pot. I drop them in a pot of sold water, bring it to a boil and boil them for 7 minutes and then let them soak until the water is cool enough to retreive them. 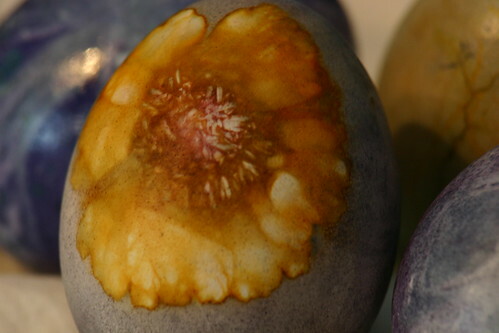 When you unwrap them, you will find the most amazing stained glass patterns on your egg. My egg below was simply boiled using Variation 1, below. To enhance the colour and pattern, wipe with a cloth and a drop of cooking oil. 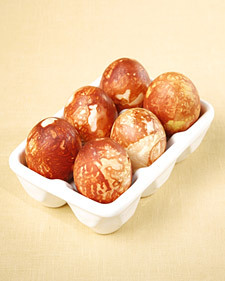 You can simply place the loose skins and eggs into a pot of cold water and boil them which gives the egg a more or less flat brown colour (or red, if you use the red skins). Nice, but the results using the other method is what I like. 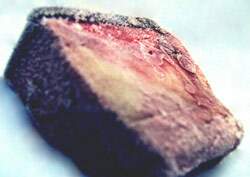 With the solid colour, you can do as I did below and scratch into the surface to make a picture. The other day, we noticed that the dishwasher didn’t seem to be actually washing the dishes. The food particles might have been a little cleaner, but they were still stuck on the dishes. Since we can’t afford to have anyone in to repair it unless we really HAVE to, I decided to see what, if anything, I could do in order to prevent a repairman’s visit. Firstly, I looked at the lower spray arm to see if the supply tube was able to extend up to spray the middle of the machine. It was. Then I noticed that the holes in the spray arm, itself were clogged with debris. With a pair of needle-nose pliers, I removed what I could from the holes themselves. It appears that there is more stuff stuck in there. I may have to replace the part itself. Then I took a look in the back of the inside of the machine and saw that there was a lot of crud in behind filter housing and around the sump cover. Since these were attached with bolts that I needed a ratchet set to remove, I borrowed one from my brother-in-law. Once I removed the filter housing, I removed a handful of what looked like handmade paper…. bits of paper, seeds, cat fur, and macerated bones. Ick…. However, as icky as that was, I had an ickier surprise waiting under the sump cover! The sump cover is held on with two long bolts. Once I got it off and flipped it over I was horrified by what it looked like. The entire underside (I really wish I had thought to take a few photos…) was coated with what looked like earwax… About a cup and a half of sticky, slimy, gummy, waxy crud — and mold! It took me about 20 minutes to clean the cover which has a grille around the sides and several baffles on the underside. I ended up resorting to using an old toothbrush and Ajax cleaner. Before putting it back on, I used a big sponge to soak up the water that was in the bottom of the sump reservoir and then felt around to see if there was anything sitting in the bottom of it. The earliest dishwashing machines involved a dish rack on a spindle with a basin of water underneath. A hand crank rotated the dish rack, splashing it through the water [ref]. This was not an efficient or effective way of washing dishes. Josephine Cochrane invented the modern dishwasher in 1886. Cochrane was a wealthy socialite whose servants kept chipping her fine china while hand washing it. She developed a rack and water jet system that debuted at the 1893 Chicago World Fair. The company she founded eventually became KitchenAid. A safety tip: Never, ever… EVER… put a sharp knife pointed upwards in the dishwasher. If you should slip while loading or unloading the dishwasher, you could land on the knife. It has happened, with fatal results**. * I wish they would make these shocking pink or orange or something. She is constantly leaving these on plates, dropping them on the floor, or on the counters. Since they are clear plastic she can’t see them. I am constantly finding them sticking to my feet, getting stuck in the vacuum cleaner, finding them blocking the kitchen drain and, now, gumming up the works in the dishwasher…. Worse, I find the actual patches scrunched up on plates or stuck to the carpet. I am afraid one of the cats is going to eat one. It would kill them! One day, she dropped one in a bowl we use to drop burning matches in in the bathroom. I just about set fire to the house when it caught fire and I couldn’t put it out. ** On 22 January 2003, a five-year-old Kentucky girl died of wounds received when she fell onto a knife exposed in an open dishwasher. The fatal accident befell Payton Michael McElroy during a visit at her grandparents’ house in the company of her mother and brother. The two children were playing while the grandmother was unloading the dishwasher, and somehow during this play session the girl tripped and fell onto a knife housed on the open dishwasher’s door. The blade punctured the child’s heart and left lung. My dear friend, Elie’s, cartoon. As always, his acerbic wit hits the nail on the head… so to speak. You may recognise some of the actors in this. Directed by Billy Zabka, 80s “movie bully”, who also plays a caricature of himself in the video. “Sweep the Leg” is a music video by the band No More Kings. You haven’t washed you hair in HOW long???? I was sitting in the waiting room at my chiropractor’s office the other day, reading a magazine. I can’t recall, now, whether it was McLean’s or Readers Digest. The article that I read was about the new fad of “not washing your hair”… Not “washing it less often” (a good thing) …. Not washing it AT ALL….. Not washing it in several YEARS… EVER! According to the mantra of these people hair “self cleans“. No…. It doesn’t. Unlike an oven, your head does not have a self clean setting. The oil remains and your hair just gets dirtier and dirtier. “You don’t see rabbits or monkeys shampooing their hair and their hair is soft and fluffy so I don’t have to shampoo, either”. I can’t speak about monkeys but rabbits lick their fur (I had a rabbit so I am an authority on this point). Saliva has enzymes which cut through oils and grease, the same way shampoo does. “The Edwardians and Victorians didn’t have all the hair products we do and they prided themselves on their soft clean hair“. 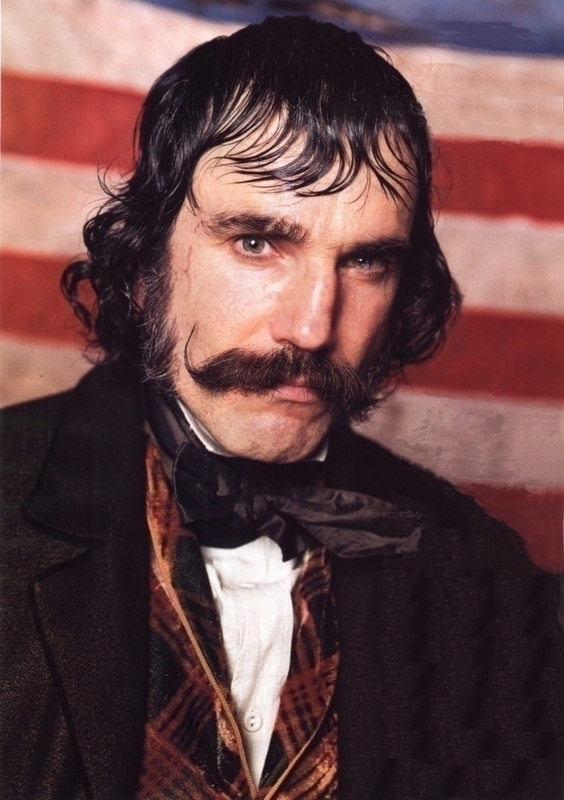 If you have ever seen any early photographs, the vast majority of sitters had greasy, oily hair. Trust me…. Besides, when they washed it, they used soap, plain old soap made from fat and lye, to wash their hair. Ever heard of an Antimacassar“? The Anti-Maccassar was a doily-like item placed on chairs to prevent the staining of furniture by Macassar oil which our forbears worked generously into their hair to counter the drying effects of soap and/or to cover the smell of the normal oils from infrequent washing. I wish the article had been accompanied by photos of the poor souls, including, supposedly, a “model” (male) who outrageously claimed “No one can tell”, just so I could judge for myself that their hair looked “okay”. Trust me, either you hang about with blind people or they are lying through their teeth when they tell you with “incredulity” that they “hadn’t noticed”. As well. someone must do a study on the vast number of your friends who have no sense of smell when they claim “they can’t detect any smell” from your unwashed locks. I’m judging that your friends suffer from the condition called “The Emperor’s New Hair” when they assure you that the fact that you don’t wash your hair is a complete surprise. Sure, it is possible that they simply assume you have taken to “Greasy Kid Stuff” and that’s why your hair LOOKS the way it does. But short of covering up the smell with “Hai Karate”, your hair smells… and it smells BAD (Of course, it isn’t going to smell any better with the Hai Karate but at least it will smell more of bad cologne). Trust me when I tell you that hair left unwashed whether a week or a year, unless one has been out camping by a wood fire, smells exactly like seal blubber. I have smelled seal blubber and it smells exactly like unwashed hair. Fact… the oil that coats your hair is fat… blubber is fat… and it doesn’t smell like roses. Here’s a hint. WASH YOUR HAIR! You might also want to get some friends who will tell you the truth.